Flea markets can be home to many hidden treasures scattered among the throngs of items. Home décor and garden items are big sellers at many markets and can be fun to create for the crafty individual with an entrepreneurial streak. Making an item and having it sell, while flea market visitors compliment you can be a very rewarding experience. 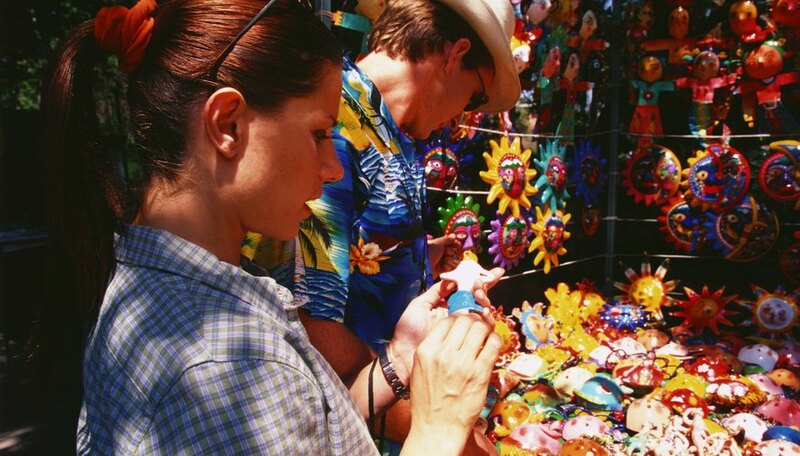 There are a number of arts and crafts ideas that just might make you the hit of the flea market. Making picture frames using rolled-up magazine pages is sure to attract customers to your colorful flea market space. These items are likely to be a hit with children and teenagers. The most efficient way to make the frames is to purchase a wood picture frame from a craft store and glue the strips on top. Create the strips by rolling a magazine page as tightly as possible. Once the roll is formed, you can tighten it by twisting it in your hands. Glue the roll together and let dry. Repeat the process until you have enough to cover your wood picture frame. Carefully use a razor blade after the glue is dry to re-size any pieces, if necessary. Then glue the magazine rolls to the frame. Do not press too hard, as this may cause the rolls to lose their rounded shapes. People are always losing their keys. A key rack to hang on the wall near the door may prove to be just the solution. If you are skilled with using a saw, consider making these handy items to sell at a flea market. Create them in a variety of shapes and sizes. Sand down, paint and add key hooks. Make sure to nail a picture hook to the back for easy mounting to the wall. Some shape ideas you may wish to use include a car, various animals and a key. To appeal to those who may be looking for something plain, create some that are simple squares or rectangles varnished in a dark, wood tone. Cement stepping stones make a lovely addition to a garden or walkway and are likely to sell well at flea markets. To create, obtain a circular or square mold. You may be able to purchase some at a craft store or build your own by forming the shape from galvanized steel strips. Coat the mold with cooking oil. Fill the mold with concrete mix. Any type of cement should work, but you may wish to consider using a type sold at most craft stores specifically for stepping stones. From here, you have several options. You may want to make a mosaic stepping stone by purchasing colorful glass and pushing it into the semi-dried cement. If you are handy with carving, let the cement firm up and carve a pattern or picture into the stone. Perhaps you’d prefer painting a design on the stone once fully dry.